A new Indie Royale is here, for another four days! As per usual, you pay the minimum to get the games, and if you beat the minimum, you will also get an album with the games. At this point there are 5 games, and most of the dlc unlocked for one of them. All but Explodemon are available on steam, and all are available on desura. 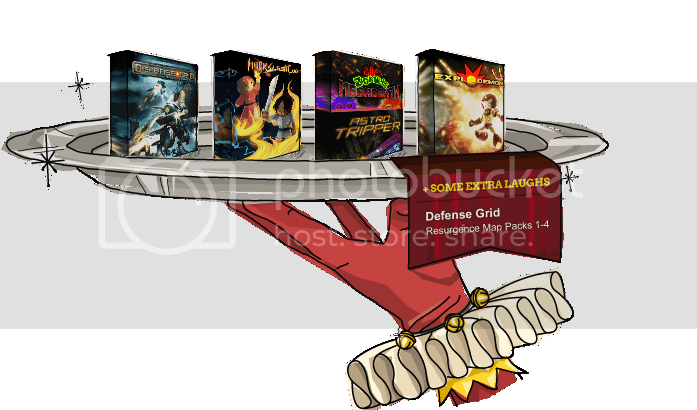 This bundle is well worth getting if you don't already have Defense Grid (and enjoy tower defense games!). Hack, Slash, Loot is redeemable on steam, but it has not officially be released yet (and thus is unavailable for purchase on steam at this time). You can purchase the bundle here! Next up is Gooey Blob's accessible, retro turn-based dungeon crawler, Hack, Slash, Loot for Windows and Mac in a Steam debut, Windows and Linux on Desura, and Windows/Mac/Linux DRM-free. True to the Roguelike genre, dungeons randomly generate, providing a unique experience every time, as players uncover thousands of items to loot and monsters to hack and slash, accompanied by attractive retro pixel art. PomPom Games offers a pair of frantic shooter titles in the form of Alien Zombie Megadeath and Astro Tripper for Windows on Steam, Desura, and DRM-free. In Alien Zombie Megadeath, players attack, dodge, and perform gloriously intense tasks while playing as 'ill-fated spacemen'. And in an update for to the award-winning Space Tripper from the talented UK studio, Astro Tripper affords players a tiny ship against hoards of other crafts and big bosses. The final featured game is Curve Studios' incendiary 2D platformer, Explodemon for Windows on Desura and DRM-free. The title is an explosive homage to SNES-era platformers mixed with a modern physics-puzzle twist, and the PC version of the quirky PlayStation Network game offers all kinds of intense fun. And watch out for an Indie Royale-exclusive bonus related to this game a little later in the bundle.